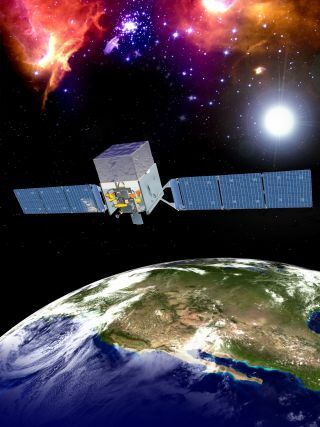 NASA is planning to announce a discovery from its Fermi Gamma-ray Space Telescope on Thursday (Nov. 1) that will shed light on the early universe, officials said. The announcement will "discuss new measurements using gamma rays to investigate ancient starlight," NASA officials said in a statement today (Oct. 29). The findings, which will be published in the Nov. issue of the journal Science, will be revealed during a teleconference Thursday at 2 p.m. EDT (1800 GMT). The Fermi telescope launched in June 2008, and has been probing the sky in short-wavelength, high-energy gamma-ray light ever since. The observatory is named after Italian physicist Enrico Fermi, winner of the 1938 Nobel Prize in physics for his work on radioactive elements. He was a pioneer of high-energy physics, the domain of the Fermi telescope.